Facing the sea and surrounded by mountains, the city Shenzhen is an important hub of Southern China's international maritime and land trade. A mild climate and beautiful scenery ensure the delights of the package for your trip. Here you will visit Splendid China, a world-famous tourist attraction. This is the largest ever collection of miniaturized scenic attractions from all over the world. With our well-designed arrangements and quality service, you are certain to enjoy your private vacation in this special economic region. Shenzhen is a racy, modern city neighboring Hong Kong. Though there are few historical sites in the city, people are impressed by its prosperity. The Splendid China - Folk Culture Villages is considered one of the largest miniature scenery parks in the world. It is a wonderful opportunity to visit a great numbers of China's most popular historical and cultural sites in just one day. 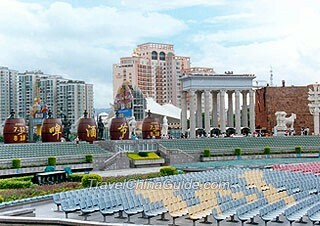 This private tour itinerary includes almost all the main sightseeing spots in Dongguan city. 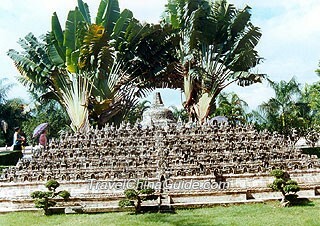 The most valued places are Humen Ancient Town and Nanshe Ancient Village. You will have a chance to enjoy the beautiful lake scenery at Wanlu Lake and the fantastic mountain scenery in Guishan by taking this package tour of Shenzhen. 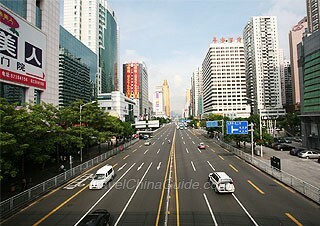 Shenzhen City - If you arrive early, it should be a good idea to learn this city by yourself today. The best place to have a great bird's eye view of the city is located at the junction of Shenzhen Dong Lu, Jiefang Lu and Baoan Nan Lu - the Diwang Mansion. The lift will take you to the top of this 384-meter-high building in 50 seconds, where you could have the best viewing angle. Splendid China - This miniature scenic area covers an area of 300,000 square meters. It collects 82 different miniatures of Chinese famous ancient buildings, landscapes and residential houses which could represent a living history and custom of China. All of these spots are made on a scale of 1 to 15 and laid to replicate their locations on China map. Additionally, there are over 50,000 terra cotta figures positioned in different spots to enhance the models' original flavor. Folk-Custom Culture Village - The Village aims to display the varied cultures and customs of these ethnic minorities in China. In the 200,000 square meters exhibition area, 25 different villages of 22 ethnic groups are positioned at a ratio of 1:1. Besides of knowing the unique buildings of those groups, travelers also have opportunities to participate in the various kinds of festival celebrations, taste exotic food and purchase some delicate handicrafts. If you come here at night, you will be lucky to watch three large and splendid folk dance shows, which could give you an astonishing impression of China. please let me know what is the charge from shekou ferry point to Guangzhou by taxi ?. whether we get taxi outside the ferry ? Generally, passengers are going to Shenzhen by high-speed train to Guangzhou becaues taxi fare is very high. If you take the high speed train to Guangzhou, you need to take the Bus No.331 to Shekou Port Subway Station first and transfer to Subway Line 2 to Houhai Station, and then change to Subway Line 11 to Futian Station. And take the high speed train to Guangzhou South Railway Station with a duration around 50 minutes. You can take the subway Line 11 to Futian station and transfer to Line 3 to Shaibu Station. And from Exit B you only need to walk for 1 minute to the hotel. Thank you. Is really helpful. My wife and I will be in Hong Kong for about 4 days for our wedding anniversary. We're planning on viaiting Shenzen since we've toured most of Hong Kong previously. How long will it take to get a visa for Shenzen? For tourist visa, it usually takes 4 working days for processing, and you can apply for it at your local Chinese embassies, consulates and other Chinese diplomatic missions in person. Yes. You need to apply for the Chinese visa in advance before you enter to Shenzhen.